We don’t do a ton of crafts around here, or, to be more exact– I don’t do a ton of crafts (you can always find scraps of paper and glitter all over the house, courtesy of my 8 year old). For one, it’s hard to have an interrupted moment to get creative (beyond painting with my toddler) these days, and secondly, crafting is not my forte, it is not something that speaks to my soul. I think I mostly get my creative fix in the kitchen when I do some free-hand cooking or baking. But once in a while, I really enjoy getting together with my girls…as long as it is easy! 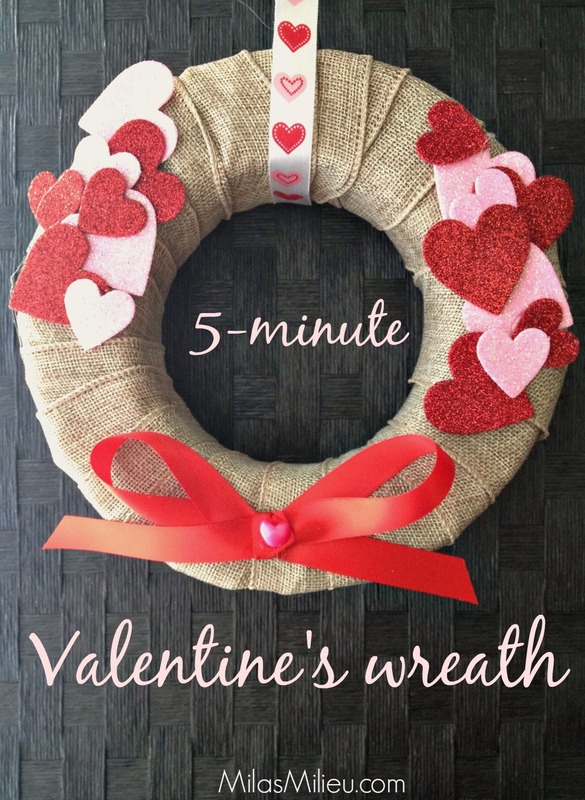 This DIY Valentine’s wreath couldn’t be easier. It is also very inexpensive, all the supplies are from a Dollar store. Even with the help from a 2 year old, it didn’t take us more than 5 minutes to put it all together. 1. Hot glue one end of the burlap ribbon to the foam base (be careful pressing the burlap, the hot glue seeps through it easily.) This will be the back side of the wreath. 2. Wrap the burlap all around the base and secure the end with hot glue on the back side of the wreath. 3. Start hot gluing glitter hearts in random order, pressing each one for a few seconds to adhere. 4. Make simple bow from your decorative ribbon and hot-glue it in the center of the bottom part of the wreath, glue a bead in the center of the bow. 5. 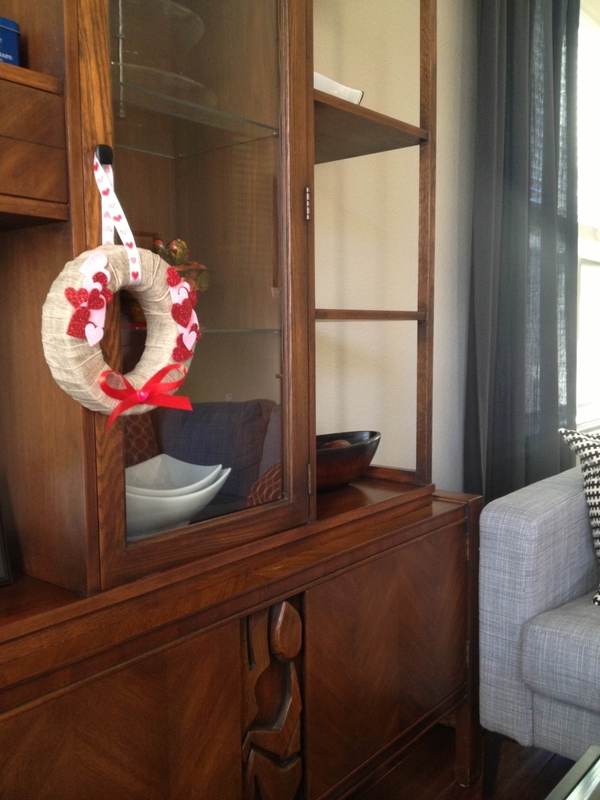 Thread decorative ribbon through the wreath and hot glue to make a loop for hanging the wreath. Next Valentine’s “craft” we plan on doing is more up my alley: Valentine sugar cookies. This has been our tradition for a few years, kids and I look forward to it every time. Come back for the recipe soon! Are you a crafty person? 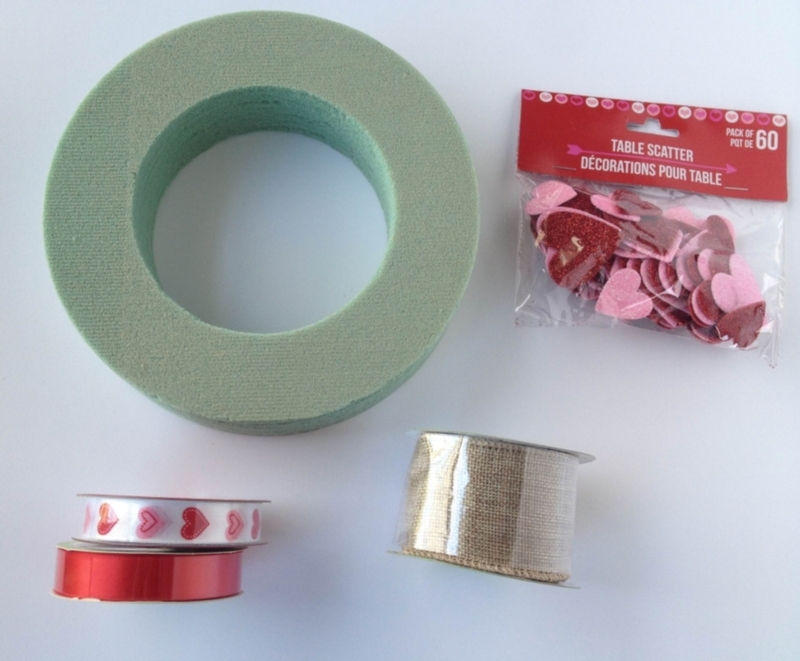 Do you do Valentine’s crafts, easy or otherwise? Thank you, Courtney, working on it was the most fun for me! It’s great, Mila! I’m not a crafting person either, although I admire those who can do it. Your daughter is adorable! Thanks, Amy! I love doing projects with her, one of my most cherished moments. LOVE this! 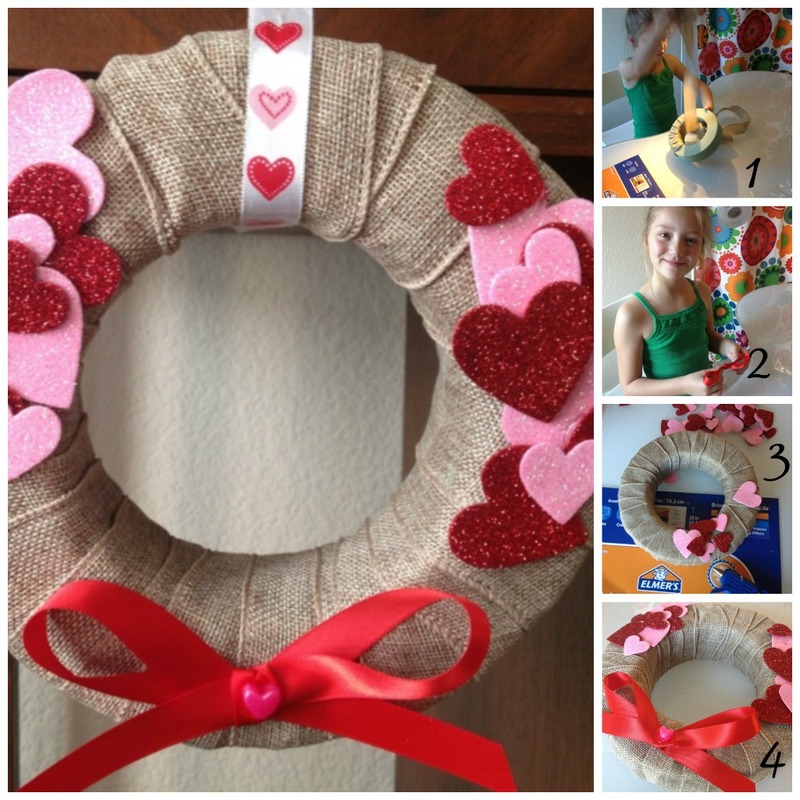 I love crafts but not too good at valentines crafts but this is so cute! Great job! Thanks, Keri. Glad you stopped by! Oh, I love anything that has burlap involved. Great way to incorporate a holiday and a craft, love it! Burlap is great, so easy to use for any season, and adds a touch of “homey” to the decor, I think. It is also not expensive! Gotta love the 5 minute crafts! And, it’s so adorable! Hi Melissa! Fast and cute– my favorite type of projects. Thanks for stopping by! I love this idea! 🙂 I have gotten tired of my old wreath, but dreaded making another one! This looks so easy – I think I will try it! It was super easy, Sarah! Mila, this is so cute! I can’t believe that it only took you 5 minutes. Now that’s what I call smart crafting!